In the form of fantastic and mystical visions of the world, of still vague theoretical ideas, and of social movements with more or less definite contours, in very different historical eras, one therefore finds the first fruits of socialism. How can such a phenomenon be explained? After this point one could say: socialism arises in various eras as a result of the antagonistic character of progress; each advance of civilization, that is, of the characteristic development of the forces of production, implies a worsening of the fate of the working classes, delivered over to the brazen exploitation of the rich and powerful, the promoters of economic progress who nevertheless do not hesitate to sacrifice a multitude of individuals on the altar of that same progress. Reciprocally, among the classes which have fallen victim to this progress and which bear all its burdens without enjoying any of its benefits, a radical tendency then breaks away, devoted to a project for recreating the world that always has the same features: abolition of classes, the community of wealth, in a word, socialism. This is a phenomenon that we can illustrate historically. After the Punic Wars against Carthage (2nd century B.C.) the Roman world attained the summit of its external power, while a vast system of servile exploitation was developing internally. But this success also had another side. The small-scale free producers had been ruined for the benefit of the vast latifundia where a numerous army of servile laborers toiled under the yoke. Despite an attempt to implement agrarian reform (ager publicus), the Roman masses were reduced to being miserably entertained with “bread and circuses” by the oligarchs who had seized power. It was in this context that Christianity made its appearance. Although it derived from Judaism, it is clear that if it was capable of finding an echo in Roman lands this is due to the fact that it had found in the domains of Rome a social terrain that was especially favorable for its propagation. Discussing the first Christians, Engels explains that the latter were recruited from the “laborers” and the “dregs”; that they belonged “to the lowest layers of the population, as would be expected of a revolutionary element”. What did this new religion advocate? An apocalyptic resolution to the social and moral crisis that was affecting the Roman world: soon, the tyrants, the wicked, and the impious (this clearly includes all the oppressors and exploiters) will be punished and Christ will return to inaugurate his reign of justice and equality for a thousand years, itself merely a prelude to the Last Judgment where the faithful will enter the New Jerusalem and enjoy eternal life.... This prediction is found in the Book of the Apocalypse of John (67-68 A.D.). Here, as Engels points out, you do not encounter any sort of “religion of love”, of “love for those who insult you” or “blessing those who curse you”; instead, it preaches vengeance against those who persecute the Christians and it is with an iron rod that Christ shall punish the impious when he returns. Such is the character of this kind of socialism: an obviously mystical socialism, linked to a supreme savior, which finds its culmination in an otherworldly beyond following passionate struggles against the infernal powers of the earth: the powerful, the rich, the tyrants. If one now moves on to the Middle Ages, here, too, starting in the 11th century, one witnesses an advance of civilization as a result of technical progress (for example, the construction of larger ships), and from the partial reestablishment of security, which allowed the growth of exchange. Thus the cities acquired a certain splendor, having become important focal points of civilization with their palaces, town halls, markets, workshops, schools, universities, cathedrals and convents. But the same causes produce the same effects. On the one side, the appearance of an eager bourgeoisie and a corrupt clergy which flaunt their wealth and luxury, and, on the other end of the chain, the appearance of a mass of persons liberated from personal and glebe servitude, but composed of the uprooted, the excluded, and vagabonds; or, as Marx described the process: “In insolent conflict with king and parliament, the great feudal lords created an incomparably larger proletariat by the forcible driving of the peasantry from the land, to which the latter had the same feudal right as the lord himself, and by the usurpation of the common lands.”5 It was during this phase that a wave of socialism arose, accompanied by radical movements that violently attacked the secular and ecclesiastical powers. These movements, with the help of some prophets and inspired individuals, preached the advent of a new millennium of Christ that was to coincide with the beginning of the reign of God on earth. This is how Joachim of Fiore interpreted the Apocalypse, which he called the “millennium of the third age”, destined to arrive soon (in 1260) and to bring about the disappearance of the Church of Rome, that new “Whore of Babylon”. Despite merciless repression, the movement persisted. Gérard Segarelli’s Apostolics (he was burned at the stake in Parma in 1300), and the movement of Fra Dolcino (burned at the stake in Vercelli in 1307), both advocated the abolition of private property by means of propaganda in the cities and a peasant guerrilla insurgency. In Bohemia (1420) Ziska’s Taborites tried to make Pilsen the New Jerusalem where “the Kindgom of God on earth” would be realized. Even in the 16th century, socialism was still active under the veil of religion: with Münzer’s current during the Peasant War of 1525 in Germany; with Münster’s Anabaptists in Westphalia (1534); and finally, the highest point of millenarianism in Europe, the Levelers and the Diggers who, during the English revolution of 1648, still identified socialism with the advent of the millennium. But this was the era of exploration, of discovery, of the flourishing of the sciences and also the beginning of the crisis of the ideological system bequeathed by Christianity: of its dogmas, its stories, and all its interpretations. This civilizing process led to the emergence of modernity. From that point on, socialism tended to free itself of its religious trappings, but only in order to become a “nowhere place”, as was the case with Thomas More and his Utopia, Rabelais and his Abbey of Thélème, and Campanella and his City of the Sun. In the 18th century, the world was reconstructed along the lines of a return to the “state of nature”, and the state of civilization saw itself accused of having corrupted man. This is the socialism of Rousseau, Mably, Morelly, and Restif de la Bretonne, whose ideas would inspire the communism of Babeuf’s and Buonarotti’s Conspiracy of Equals in the French revolution, a formidable social explosion. There is, then, a certain endemic kind of socialism that, under various names, reappears with each great leap forward made by civilization and opposes the disorder caused by the latter. One thing is clear, however: this kind of socialism has never been victorious in its enterprises nor has it effectively changed the course of world history. It never succeeded in imposing its solutions. On every occasion, it is the world as it is which imposed its own solutions by overcoming its successive crises in its own way. After the 3rd century, it was not primitive Christianity that prevailed but the Christianity that became the State Religion. From then on, the accusations against the rich and powerful cease. Instead, a saccharine “religion of love” is declaimed to get the oppressed to turn the other cheek towards their oppressors so that they will love one another; so, too, ended the passionate hope for radical change, for what was preached was resignation, the consolation of eternal life after death: the “opium of the people” religion. As for the Apocalypse of John, the slate is wiped clean. In its place, the Gospels (where everything and anything can be found) prevail. In short, Christianity as a revolutionary tendency is defeated. The various subsequent attempts to realize socialism were equally vain and sterile: a vague “New Jerusalem” here, a no less vague “Egalitarian Republic” there, and all these experiences ended in confusion, or else were drowned in blood, their leaders dragged to the executioners after being condemned as heretics by the tribunal of the Holy Inquisition. Perhaps the time of socialism will arrive with the beginnings of the modern world? Taking advantage of the changes that were beginning to take effect—wasn’t this the way to make their mad hopes come true? If only it were so! Once the French revolution is consummated, drained to the dregs, there is disillusionment; and then came, at the beginning of the 19th century, the Saint-Simons, the Fouriers, and the Owens, to prove that the revolution in question had passed completely to the side of its subject: at least that is how Engels interpreted the reaction of having been deceived attested by the “great utopian socialists”.6 The latter, once the revolutionary storm had passed, were only capable of demonstrating the insignificance of the results obtained in comparison with the human emancipation that was more or less the goal they all had in common. As for “Enlightenment”, it is a bourgeois world that has begun to establish itself. The latter has done nothing but continue to segregate a multitude of defects, some of them ancient, which it exacerbates, and others more modern, which it creates from scratch. And Engels assesses the bitter conclusion made by the great utopians. The end of the Ancien Regime was supposed to usher in the reign of the “rational State”. But the latter was first realized in the Terror, in the corruption of the Directorate, only to end up incarnated in Napoleonic despotism. The hope of perpetual peace was cherished. With the wars of the Revolution and the Empire a permanent conflagration between nations was unleashed on a scale never witnessed before. Social misery, that old defect, far from being absorbed, was only exacerbated: the liquidation of the last feudal bonds had led to the formation of a modern proletariat, delivered bound hand and foot to the all-powerful law of the market and to the new masters who were even more cruel and rapacious, the capitalist manufacturers. As for the fraternity of the revolutionary slogan, it was resolved into the cold desire for cash, making money, as Carlyle said, the sole link between men (the “cash nexus”). Prostitution spread to a hitherto unknown degree, the right of the first night (jus prima noctis) passing from the feudal lords to the capitalist manufacturers; this completes the picture of the kind of emancipation that was achieved. The balance sheet is therefore overwhelming. Human history has not given birth to a “better world”; not once has a notable event given the signal for a decisive revolution; all radical movements have failed, and history is a cemetery of broken dreams. Why all these failures? The crucial question is thus posed to socialism, a question that must be answered if the latter is to retain credibility, at the risk of being, in the best case, a simple recurrent fever, a flame that is always flaring up but never manages to become a conflagration that finishes off once and for all a world judged to be malignant, but which is always reborn. Socialism’s error was that it arrived too soon: it is the immaturity of the objective conditions that explains its failure. More or less theoretically sketched out, it did not possess the means to prevail. From then on, it would be defeated by stronger adversaries; or, as Engels emphasized, and which amounts to the same thing, it is led to betray its own cause as a result of the situation imposed upon it. The first real cause of its failure derives from the fact that it could only avail itself of an embryonic proletariat. Thus, the millenarian revolts featured only a “displaced and homeless proletariat”, arising from the violent expropriation of part of the peasant population that a still-immature capitalism could not employ. As a result of its status as a mass excluded from feudal relations, it is the really active and radical element, ready to follow the prophets of revolutionary millenarianism and to make itself available for every adventure and the most hopeless revolts. But all were condemned to failure: because the bulk of the population was still integrated into the feudal system, which bound the peasant to the estate and the craftsman to his guild, it could not identify with these movements of the uprooted and the latter were quickly isolated and easily neutralized. This situation would still recur during the late 18th century when important social movements took place in France. Some of them had confused tendencies towards socialism (the Enragés and the Hebertists, 1793-1794, and especially Babeuf’s Conspiracy of Equals in 1796). Once again, however, as expressions of a proletariat that was still too embryonic, embedded within a mass of small property owners who, in the city and the countryside constituted the vast majority of the population, these movements did not have the slightest objective possibility of realizing their goals. Society’s backward economic condition also worked against socialism. For one cannot refrain from posing the question: supposing that socialism could have been established, could it have provided what the afflicted and the uprooted people of the Middle Ages called “the Kingdom of God on Earth”? Or, phrased more realistically, could it have really changed the material and social conditions of the vast majority of people? Its goal, as we have said, was the “community of goods”; everything was to be made common property, everything would be everybody’s. In fact, given the state of economic backwardness that characterized society at that time, such a project could only have meant one thing: the socialization of poverty. For this reason, as it was incapable of truly resolving the social question, it advocated an ascetic socialism, one that was sublimated in a totally Christian way as a “cult of poverty” or else was disguised in a Rousseauian and naturalistic way by the term “simplicity of needs”, all crowned by an austere and virtuous moralism. Our authors comment: “Because Taborite communism was purely internal to their group, it degenerated into simple raids that were finally formalized as ‘fiscal exactions’.” This explanation does not make much sense. Supposing that this communism were to have spread, it seems it would not have changed: with that same determination not to work that characterized it, it could only have collapsed into an even more extensive degeneration. Our two authors, totally impregnated by the idea of not working which is suggested by today’s hyper-mechanized capitalist society, abstracted from the historical conditions in which such an experience evolved, which allowed them to avoid the critique of this rejection of labor by the Taborites, the immediate cause of their degeneration. Thus, the second real cause of the failure of socialism is the absence of a firm material basis that would allow it to be established. It is not taking from the rich (at that time an insignificant minority of the population) to give to the poor that produces socialism, it is by seizing the existing productive forces, numerous and highly developed, to make them work for the benefit of the collectivity. Because this condition was not present, this kind of socialism was therefore unable to do anything but fail with regard to its most elementary goal: to lift the immense majority of humanity out of the reign of poverty. In other words, even if it could have seized control of society, this socialism would not have changed anything. In fact, socialism failed because it was not socialism, but capitalism that was required by history: “The fanatic agent of accumulation, it forces men, relentlessly and mercilessly, to produce for the sake of production and instinctively drives them to develop the productive powers and the material conditions which, and only which, can form the basis of a new and higher society.”9 Henceforth, what form would this kind of socialism assume? Delhoysie and Lapierre, evoking the Andalusian anarchism of the late 19th century, which, for its part, developed in the still-backward conditions of the south of Spain in that era, provide us with a quite revealing picture: “The aspirations of anarchism were directed towards an imminent golden age, but they also hearkened back to an obsolete past whose nostalgia was omnipresent: it wanted to create the rural communes that existed in Spain during the 16th and 17th centuries.” This captures the essence of this kind of socialism: in fact, it was reactionary; rising capitalism exacerbated the living conditions of the poor, of the victims of violent expropriations, or else condemned them to endure the new kind of exploitation that was being established; from then on, this progress of the world was only seen as a curse, as injustice, inhumanity, a deviation, and this kind of socialism came to look back fondly upon the old conditions of existence, which it idealized or reinvented in a totally “reactionary-revolutionary” way in the form of a completely renovated past. Everything set forth above concerning the mentality and behavior of the men of that era is true enough. The tendency of the socialism of that time was an allergic reaction to nascent capitalism. But what conclusion can be drawn from this? It would be vain and ridiculous to cultivate, as it seems our two authors do, a kind of nostalgia for such a socialism and for its kind of people, which incarnated their fierce determination to reject capitalism, in opposition to today’s people who, for their part, seem to fit perfectly into its mould.... In any event, those men of yore, however notable they may have been, failed historically in their attempts to prevent the introduction of capitalism. The English Luddites of 1810 smashed machinery in order to make industrial capitalism impossible. The Andalusian anarchists rejected factory labor, and made extravagant demands, as in Cordoba in 1905, where they called for six and a half hours of breaks in an eight hour working day.... In both cases, the victors were the machines and factory labor, i.e., capitalism. And even in Spain, a country where the past was held in such high esteem for so long, it is the modern capitalist mentality that has emerged victorious today, so that even that “indefatigable Spanish anarchism” is quite dead. What has been called Marxism corresponds to a radical change of perspective in the history of socialism. It appeared in an era that allowed it to confirm the increasingly dominant reality of industrial capitalism in the most advanced European countries. This clearly demonstrates that the old socialism failed in all its attempts to contain its development. 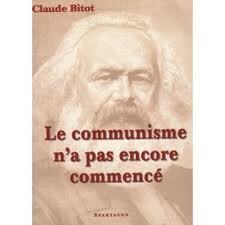 “The bourgeois historical era must create the material basis for a new world” (Marx). Such is the new vision of socialism; a socialism that, as Marx points out, would be merely “quixotic” “if we did not find concealed in society as it is the material conditions of production and the corresponding relations of exchange prerequisite for a classless society”.10 From then on, it must be consistent. If capitalism is the precondition for socialism, one must praise rather than curse, as the old socialism had done, its development. Thus, for example, that kind of apology for capitalism found in the Communist Manifesto where all the industrial achievements of the bourgeoisie are celebrated, but only within this perspective: if one wants socialism to be more than just a “beautiful idea”, then one must support “the great civilizing mission of capital” (Marx). An invitation to sacrifice in the name of a “radiant future” that would evidently never dawn? Marxism does not promise paradise (as some have claimed). But it is a fact: there is no other way to socialism except capitalism. Socialism has failed due to a lack of material means that can only be provided by capitalism. If this analysis is false, then there is no other recourse than to renounce socialism: hitherto, not having opposed the order of the world with anything but its revolt and its “beautiful soul”, it has regularly failed in all its attempts and did not see what kind of miracle could change this; thus, if nothing but a vague reformism could be hoped for, it was better to renounce its grandiloquent pretensions to “change the world”. The only thing that is certain is that, at this century’s end, history has not yet given birth to communism—this is a fact (as long as we want to dispense with the theory of the “collapse” of that which, it seems, was installed in the East). From now on, we will really begin to draw up our balance sheet. 1. Frederick Engels, Anti-Dürhing, Foreign Languages Press, Peking, 1976. 2. The application of the word socialism to movements of the distant past is obviously arbitrary on our part, since the word was first used in November 1831 (in the newspaper Le Semeur). It nonetheless has the virtue of helping to understand the nature of the movements in question. 4. Frederick Engels, The Origin of the Family, Private Property and the State, Foreign Languages Press, Peking, 1978, pp. 214-215. 5. Karl Marx, Capital, Vol. I, Part VIII, Chapter 27, International Publishers, New York, 1967, p. 718. 6. Frederick Engels, Anti-Dürhing, Part III, Chapter 1, Foreign Languages Press, Peking, 1976, pp. 327-343. 7. Frederick Engels, The Peasant War in Germany, Progress Publishers, Moscow, 1956, p. 115. 8. Yves Delhoysie and Georges Lapierre, El Incendio Milenarista, Ediciones Os Cangaceiros, 1987. French edition: L’Incendie millénariste, Paris, Os Cangaceiros 1987. 9. Karl Marx, op. cit. 10. Karl Marx, Grundrisse. Introduction to the Critique of Political Economy, Notebook I, “The Chapter on Money”, Penguin Books, Baltimore, 1973, p. 159.